The Fourth Canadian Consensus Conference on the Diagnosis and Treatment of Dementia (CCCDTD4) was held 3 to 4 May 2012 in Montreal, Quebec, Canada. A group of neuroimaging experts were assigned the task of reviewing and summarizing the literature on clinical and research applications of different neuroimaging modalities in cognitive disorders. This paper summarizes the literature and recommendations made to the conference regarding the role of several emerging neuroimaging modalities in cognitive disorders. Functional magnetic resonance imaging (MRI), magnetic resonance spectroscopy, and diffusion tensor imaging are discussed in detail within this paper. Other emergent neuroimaging modalities such as positron emission tomography with novel ligands, high-field MRI, arterial spin labeling MRI and noncerebral blood flow single-photon emission computerized tomography are only discussed briefly. Neuroimaging modalities that were recommended at the CCCDTD4 for both clinical and research applications such as amyloid and flurodeoxyglucose positron emission tomography, computerized tomography and structural MRI are discussed in a separate paper by the same authors. A literature search was conducted using the PubMed database including articles in English that involved human subjects and covered the period from the last CCCDTD publication (CCCDTD3; January 2006) until April 2012. Search terms included the name of the specific modality, dementia, Alzheimer's disease, and mild cognitive impairment. A separate search used the same parameters but was restricted to review articles to identify recent evidence-based reviews. Case studies and small case series were not included. Papers representing current evidence were selected, reviewed, and summarized, and the results were presented at the CCCDTD4 meeting with recommendations regarding the utility of various neuroimaging modalities in cognitive disorders. The evidence was graded according to the Oxford Centre for Evidence Based Medicine guidelines. Due to the limitations of current evidence, the neuroimaging modalities discussed in this paper were not recommended for clinical investigation of patients presenting with cognitive impairment. However, in the research setting, each modality provides a unique contribution to the understanding of basic mechanisms and neuropathological markers of cognitive disorders, to the identification of markers for early detection and for the risk of conversion to dementia in the at-risk populations, to the differentiation between different types of cognitive disorders, and to the identification of treatment targets and indicators of treatment response. In conclusion, for all of the neuroimaging modalities discussed in this paper, further studies are needed to establish diagnostic utility such as validity, reliability, and predictive and prognostic value. More multicenter studies are therefore needed with standardized image acquisition, experimental protocols, definition of the clinical population studied, larger numbers of participants, and longer duration of follow-up to allow generalizability of the results to the individual patient. Neuroimaging plays a central role in the clinical research of cognitive disorders. A group of Canadian neuroimaging experts were asked to review and summarize the literature, and to provide recommendations regarding the clinical and research applications of different neuroimaging modalities in patients with cognitive impairment to the Fourth Canadian Consensus Conference on the Diagnosis and Treatment of Dementia (CCCDTD4) held 3 to 4 May 2012 in Montreal, Quebec. Other groups have published similar guidelines and recommendations, most recently the European Federation of Neurological Societies guidelines on the use of neuroimaging in the diagnosis of dementia . The group built on other published guidelines, updated the evidence, and presented a rationale for the recommendations to CCCDTD4 in two papers. One paper by the same authors covered neuroimaging modalities currently indicated for clinical use in addition to research in cognitive disorders including [18F]flurodeoxyglucose and [11C]-labeled Pittsburgh compound-B amyloid positron emission tomography (PET), computerized tomography and structural magnetic resonance imaging (MRI). The current paper covers promising neuroimaging modalities that remain in the research realm but are not yet recommended for the clinical investigation of cognitive disorders. For any medical test to have a diagnostic value in the individual patient, it must have established validity (having being tested across the spectrum of severity with appropriate randomization and compared with a golden diagnostic standard by an independent blinded rater), and to have established sensitivity, specificity, predictive value, and test-retest and inter-rater reliability (Appraisal of Diagnostic Test 2010 ). Most of these elements are still lacking for the neuroimaging modalities discussed in this paper. On the other hand, these modalities have important roles in addressing several research questions, such as: identification of the basic mechanisms of cognitive impairment and basic neuropathological markers of cognitive disorders; identification of markers for early detection and differentiation between normal aging, risk state, and dementia; identification of markers for differentiating between different types of cognitive disorders; understanding the neurobiological course of cognitive disorders (for example, changes in neuronal networks as a result of neurodegeneration and brain injury); identification of therapeutic targets and evaluation of the mechanism of action of different therapies in cognitive disorders; and enriching patient selection for therapeutic trials by identifying reliable neuropathological markers for different types of cognitive disorders. There is significant variability in individuals presenting with cognitive disorders. The variability could be specific to the neuroimaging modality used but it could also be a general variability affecting most test results whether it is clinical, biological or from neuroimaging. In addition to the expected general variability (for example, demographic characteristics, stage of illness, and co-morbidity), there is emerging evidence regarding the impact of cognitive reserve on various test results. 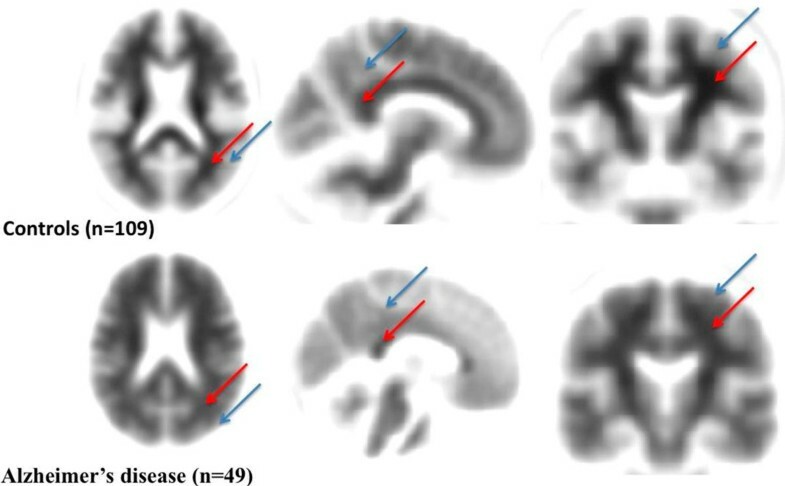 This effect was demonstrated in recent neuroimaging studies where regional cerebral blood flow measured by PET scanning was inversely related to the level of education and occupational attainment, indicating higher resiliency in those with higher cognitive reserve in the face of Alzheimer's pathology . Issues related to sources of variability such as cognitive reserve have not been considered adequately in neuroimaging studies at this stage. The modalities discussed in greatest detail in this expert consensus review are: functional magnetic resonance imaging (fMRI), magnetic resonance spectroscopy (MRS), and diffusion tensor imaging (DTI). Other modalities such as PET imaging with novel ligands, arterial spin-labeling perfusion MRI, high-field MRI, and noncerebral blood flow single-photon emission computerized tomography (SPECT) are only discussed briefly due to the limited literature. A literature search of the PubMed database was performed and covered the period from the last CCCDTD publication (CCCDTD3; January 2006) until April 2012, so as not to duplicate the reviews already performed in the previous meetings [4, 5]. Search terms included the name of the specific neuroimaging modality (fMRI, MRS, or DTI) combined with the terms 'dementia', 'Alzheimer's disease' (AD), or 'mild cognitive impairment' (MCI). The search was limited to 'English' and 'Humans'. A separate search used the same parameters but restricted it to review articles to identify recent evidence-based reviews. The purpose of this process was to summarize the evidence for the consensus meeting and make recommendations regarding the role of emerging neuroimaging modalities in cognitive disorders. This review was therefore focused and selective rather than a systematic review, and the search was not defined by statistical parameters but rather by a series of decisions by the authors to include or not include papers based on the pertinence of the information they contained. This approach resulted in some selected papers being included from the period preceding the interval mentioned above, if they were deemed necessary for a better understanding of the recommendations being made. The evidence was summarized, and recommendations were submitted to the CCCDTD4 meeting for deliberation towards the goal of reaching a final expert consensus recommendation regarding the role of each selected emerging neuroimaging modality in cognitive disorders based on a majority vote on each of the recommendations by the attending members. We graded the evidence based on the Oxford CEBM level of evidence grading guidelines (Levels of Evidence, March 2009 ). The evidence for the three main neuroimaging modalities discussed in this paper (fMRI, MRS and DTI) is mainly driven from well-designed case-controlled studies with significant heterogeneity of participants and methodology. Therefore, the evidence for these modalities could be graded as 3b. fMRI techniques identify brain activity level based on endogenous blood oxygen level-dependent (BOLD) image contrast. The BOLD signal is the product of the integrated synaptic activity of neurons and is mainly detected by MRI based on hemodynamic change in the oxyhemoglobin/deoxyhemoglobin ratio. An increased BOLD signal is usually interpreted as activation and a negative BOLD response as deactivation of the underlying brain areas . There are mainly two types of fMRI studies used in cognitive disorders: those evaluating brain activation during episodic memory encoding and retrieval, and those evaluating the default mode network. Typically fMRI experiments compare the MRI signal during one cognitive condition with a control condition such as visual fixation . Episodic memory encoding function is most commonly investigated because of its early and consistent involvement in AD. Successful memory formation and retrieval requires coordinated and reciprocal activation of medial temporal lobe (MTL) structures and deactivation in areas connected to MTL areas such as the posterior cingulate cortex and parietal cortex . During episodic memory encoding, AD patients consistently show lower activation in MTL structures, particularly the hippocampus [9–11], failure of the normal deactivation in posteromedial cortical areas such as the posterior cingulate and medial parietal cortex [12, 13], and increased activation in the prefrontal cortex, probably as a compensation mechanism [14, 15]. Similar pattern emerges during episodic memory retrieval (especially the lower activation of MTL). In patients with MCI, which is a risk state for AD, the findings are mixed. During episodic memory encoding, some studies reported decreased activity [9, 16, 17] while others reported increased activity in the MTL area. This discrepancy is probably due to several factors such as differences in clinical definition of MCI, severity of cognitive impairment, and level of task performance . Few fMRI studies followed MCI patients longitudinally. In one such study, baseline hyperactivation in MTL structures during episodic encoding correlated with future cognitive decline . Another study showed that this activation declines over time, creating a U-curve pattern from hyperactivation to pseudo-normalization and finally to hypoactivation . Table 1 summarizes the key findings of fMRI studies in AD and MCI patients during episodic memory encoding and retrieval based on published meta-analysis and evidence-based reviews [21–23]. Summary of functional MRI study findings during episodic memory encoding and retrieval in Alzheimer's disease and MCI patients compared with healthy controls based on recent meta-analysis by Schwindt and colleagues  and reviews by Ries and colleagues  and Dickerson and Sperling . BOLD, blood oxygen level dependent; DLPFC, dorsolateral prefrontal cortex; MCI, mild cognitive impairment; mPFC, medial prefrontal cortex; MRI, magnetic resonance imaging; MTL, medial temporal lobe; OFC, orbitofrontal cortex; PCC, posterior cingulate cortex; VLPFC, ventrolateral prefrontal cortex. The brain network referred to as the default mode network includes several cortical areas that are particularly active at rest and deactivate during cognitive tasks. This network includes the medial prefrontal cortex, posterior cinculate cortex, precuneus, anterior cingulate cortex and parietal cortex. The hippocampus is functionally connected to this network. Recently, the correlation between the intrinsic oscillations or time courses of activity in the hippocampus and different brain regions of the default mode network in cognitive disorders has received significant attention . This technique is feasible in patients with cognitive impairment because of the ease of acquisition and the lack of task performance confounding . A significant alteration in the intrinsic functional connectivity between the hippocampus and areas in the default mode network at rest and during cognitive tasks in patients with MCI and AD has been reported [26–28]. Table 2 summarizes the findings of default mode network imaging studies in the resting state and deactivation during cognitive tasks based on a recent published review . Summary of the key findings related to functional connectivity of the DMN during the rest state or as evident by deactivation during cognitive tasks in patients with Alzheimer's disease and those with MCI compared with healthy controls . DMN, default mode network; FC, functional connectivity; HC, hippocampus; MCI, mild cognitive impairment; mPFC, medial prefrontal cortex; PCC, posterior cingulate cortex; ACC, anterior cingulate cortex; lPFC, left prefrontal cortex. Cholinergic therapy has been the mainstay for the treatment of cognitive disorders for over two decades. fMRI was used to evaluate the underlying mechanism of cholinergic therapy in healthy subjects and in patients with cognitive disorders. These studies evaluated the changes in the fMRI signal after a single dose and after short-term or long-term exposure to cholinergic agents. There is evidence for changes in the brain activation pattern in key memory, and especially attentional networks in response to cholinergic agents in healthy controls and in patients with MCI and AD during cognitive tasks. On the other hand, a significant variability in the results is observed - most probably due to heterogeneity of treatment response, variability in the pharmacokinetics and pharmacodynamics of these agents, and the inherent test-retest variability in fMRI studies . More recently, a study by Li and colleagues demonstrated enhanced resting state functional connectivity and cerebral blood flow in patients with AD in response to long-term cholinergic treatment . Few fMRI studies compared AD with other forms of dementia. A differential pattern of resting state functional connectivity and task-induced BOLD signal has been identified between patients with AD patients compared with those with Lewy body dementia [34, 35]. Other studies identified differential BOLD signal during cognitive tasks between AD patients and those with subcortical vascular cognitive impairment  and those with fronto-temporal dementia . There are several advantages for fMRI in cognitive disorders as a noninvasive and radioactivity-free modality allowing safe repeated scanning, with relatively high spatial and temporal resolution, and measurement of brain activity during specific behavior (like memory encoding). On the other hand, fMRI is limited by sensitivity to head motion, effect of task performance, brain atrophy, and transient brain and body states at the time of scanning (for example, arousal, attention, and effort). fMRI is highly dependent on neurovascular coupling, resulting from neuronal and glia activity. This dependency makes fMRI especially vulnerable to the effect of conditions that affect vascular coupling, such as vascular insufficiency, change in blood gas levels, and exposure to substances. Furthermore, a change in activation in one area during a task might be related to a pathological change in other functionally connected areas . Finally, test-retest reliability data for fMRI are just beginning to emerge in cognitive disorders . Owing to several limitations, such as variability in image-acquisition protocols and experimental paradigms used, heterogeneity of the clinical population studied, limited data in other forms of dementia, small sample size, limited longitudinal data, limited test-retest reliability data, and inverted U-curve activation patter in the MTL in the people with MCI, fMRI is not currently recommended for the clinical investigation of patients presenting with cognitive impairment (level of evidence 3b). On the other hand, fMRI holds promise in several areas such as early detection of dementia and predicting conversion of MCI to AD, distinguishing between AD and non-AD dementia, identifying treatment target and changes in brain activation in response to intervention, and evaluating neuropsychiatric and behavioral symptoms in the context of preclinical and clinical dementia. Standardization of image-acquisition protocols and experimental paradigms and establishing validity and reliability data with large number of participants and longer follow-up periods are needed. Resting state methodology is a feasible and promising methodology and can be easily integrated into current large multicenter neuroimaging studies. [1H]MRS is a noninvasive technique used to measure the concentration of low molecular weight metabolites in vivo, with a detection threshold of approximately 1 mmol/l (1 mM). Although MRS data are acquired using a MRI scanner, the method is limited by a low signal to noise ratio resulting in volumes of interest typically ranging between 1 and 8 cm3. Data analysis also involves removal of line-shape distortions, removal of macromolecule/lipid contributions if needed, and fitting of the data to mathematical model functions to increase the accuracy of metabolite-level estimates . The most commonly reported in vivo brain metabolites include N- acetylaspartate (NAA), glutamate, glutamine, choline-containing compounds (Cho), creatine (Cr) compounds and myo-inositol. Altered levels of NAA or NAA/Cr are the most common finding reported in subjects with AD [41–49] and MCI, although alterations in other metabolites including myo-inositol , scyllo-inositol , and glutamate  have been reported. Decreased NAA has been documented in subjects with AD in the occipital lobe , temporal lobe , parietal lobe , and frontal lobe . NAA is an amino acid located primarily within neurons in the central nervous system. The concentration of NAA is among the highest of the free amino acids in the brain (8 to 10 mM in brain tissue) and it normally produces the largest peak in the magnetic resonance spectrum . NAA is considered a marker of neuronal density and/or viability. Reduced NAA may therefore imply neuronal death, or it may indicate neurometabolic impairment based on the known correlation between the rate of mitochondrial activity and NAA synthesis . NAA and myo-inositol change has been noted in the hippocampus in AD, and this change has been associated with cognitive measures . In fact, the NAA/myo-inositol ratio has been shown in several studies to be the most robust marker for discriminating AD patients from age-matched normal older controls [60, 61]. NAA/myo-inositol ratios have also been previously shown to correlate with Mini-Mental State Examination scores . Interested readers are directed to the review by Griffith and colleagues for a detailed description of MRS findings in the dementias . The value of MRS as a prognostic indicator of impending dementia in subjects with MCI can only be answered by longitudinal studies. Since 2005 there have been nine longitudinal MRS studies performed in subjects with MCI. Subjects were typically followed for 1 to 3 years to identify a cohort that converted to dementia. The results from these studies are summarized in Table 3. Since 2005, there have been nine longitudinal MRS studies performed in subjects with cognitive impairment. Subjects were typically followed for 1 to 3 years to identify a cohort that converted to dementia. AD, Alzheimer's disease; Cho, choline containing compounds; CIND, cognitively impaired not demented; Cr, creatine; GE, GE Healthcare (Waukesha, WI, USA); MCI, mild cognitive impairment; MRI, magnetic resonance imaging; MRS, magnetic resonance spectroscopy; NAA, N-acetylaspartate; Philips, Philips Medical Solutions (Best, The Netherlands); Siemens, Siemens Medical Solutions (Erlangen, Germany). The most consistent finding reported in MCI subjects that convert to dementia compared with MCI subjects that remain stable is lower NAA or NAA/Cr. Lower levels of NAA/Cr have been noted in several brain regions, including the occipital cortex , paratrigonal white matter , temporoparietal lobe , posterior cingulate [65, 66], and posteriomedial cortex . In the study by Rami and colleagues, lower NAA/Cr was observed in subjects that were classified as prodromal AD and later converted to AD . Kantarci and colleagues demonstrated that NAA/Cr measured from the posterior cingulate added predictive value for conversion to dementia when combined with hippocampal volume . Furthermore, of these studies listed, three have included receiver operator curve analysis. Modrego and colleagues demonstrated that receiver operator curve analysis for NAA/Cr <1.61 predicted conversion with 100% sensitivity and 75% specificity . The area under the curve was 0.91 with a positive predictive value of 83% and a negative predictive value of 100%. Similarly, Fayed and colleagues showed that NAA/Cr <1.40 in the posterior cingulate predicted conversion of MCI to probable AD with sensitivity of 82% and specificity of 72% and an area under the curve of 0.82 . Finally, Modrego and colleagues showed that NAA/Cr <1.43 in the posteromedial parietal cortex predicted conversion to probable AD with 74% sensitivity and 84% specificity and an area under the curve of 0.84 . Despite the consistency of the studies listed above, two studies reported no baseline differences in [1H]MRS between MCI stable patients and MCI converters in the bilateral posterior cingulate and inferior precuneus [68, 69] or in the parietal white matter . Another study showed no differences in the medial temporal lobe in cognitively impaired not demented (CIND) stable patients and CIND converters in the medial temporal lobe . Although current studies show an emerging trend of lower NAA/Cr in MCI subjects that convert to dementia compared with MCI subjects that remain stable, further study is needed. Variability in participant selection, the criteria for conversion to dementia, and methodological inconsistencies in the brain region studied, the spectroscopy acquisition protocol, and the spectroscopy analysis procedures limits the generalizability of the current studies. MRS is not currently recommended for clinical investigation of patients presenting with cognitive impairment due to several limitations discussed above (level of evidence 3b). On the other hand, [1H]MRS remains a promising technique as a research tool especially for the identification of subjects with MCI who will convert to dementia. Further multisite longitudinal studies should be conducted to establish normative values. Such studies should utilize standardized enrollment criteria, diagnosis criteria and data-acquisition methods, and include automated analysis of spectra that incorporates proper prior knowledge of metabolite line shapes. Future [1H] MRS studies to demonstrate clinical effectiveness should utilize 3 T MRI where available to increase data quality. Volumetric MRI measures of the MTL or hippocampus have been validated as markers of neuronal damage and can support the diagnosis of early AD . As gray matter atrophy is presumably a relatively downstream event, efforts to detect earlier changes at the micro-structural level are worth pursuing as part of the general effort to define the earliest measurable changes that lead to AD. Diffusion-weighted imaging has been used clinically over the past 10 to 20 years, mainly to detect acute stroke. This imaging modality can provide a window into the structural integrity of cerebral tissue beyond what is visible on standard MRI. Molecular diffusion refers to the random movements of molecules, which can be described statistically given the size of the molecule and the temperature and nature of the medium through which it travels . In pure water, molecules move in all directions with equal probability (isotropy). Diffusion-weighted imaging uses information derived from the random movements of water molecules through biological tissues; white matter tracts with their neuronal membranes and myelin sheaths interfere with the random movements of water molecules, thus rendering the movements an-isotropic. The main measures obtained are mean diffusivity (MD) and fractional anisotropy (FA). These measures provide indirect information on the microscopic structural properties of white matter fibers . With recent advances in diffusion data modeling, it is now possible to determine in vivo the location of white matter nerve bundles using algorithms that estimate the likelihood that two adjacent voxels are connected (DTI tractography). This type of analysis can provide exquisite detail of the white matter tracts that connect different areas of the brain, including the large-scale neural networks that underlie all cognitive functions . Analysis of DTI data becomes more complex at fiber intersections, and estimates of white matter voxels containing crossing fibers range from 63 to 90% depending on the estimation method used . This implies that most first-generation DTI studies are limited in their power in at least two-thirds of the voxels, enabling clear visualization of only the most prominent white matter tracts such as the cortico-spinal tract. With the emergence of new high angular resolution diffusion imaging methods, it has been possible to manage the problem of crossing fibers and the complex configurations of bundles of white matter [76, 77], enabling much more detailed visualization of smaller white fiber bundles. These tools are well suited to study large-scale brain anatomical connectivity and are particularly well suited for the study of complex brain disorders such as AD. Several studies in the past decade have focused on the value of DTI measures in the differentiation of MCI and AD from controls; 55 studies comprising close to 2,800 subjects were included in a recent meta-analysis. This analysis compared the contribution of FA and MD to the better established imaging measures of MTL atrophy in the diagnosis of MCI and AD using the magnitude of effect sizes as the method of comparison. Studies using FA measures at the level of regions of interests showed significant differences between AD and controls, with the largest effect sizes in the cingulum, splenium of the corpus callosum, uncinate fasciculus, superior longitudinal fasciculus and frontal lobes. For studies using MD, the regions of interest most useful to distinguish AD from controls were the hippocampus, splenium of the corpus callosum, parietal lobes and temporal lobes. In general, effect sizes were superior for the volumetric MTL measures compared with the DTI measures for the discrimination between controls and AD subjects. Predictably, the differences between MCI and controls were of less magnitude, with only regions of the cingulum showing moderate effect sizes using FA. However, in the comparison between MCI and controls, studies using hippocampal MD showed superior effect sizes compared with volumetric MTL measures . Another recent review, using pooled analysis of regional mean FA and MD values, showed that MD values are different in all white matter regions of the brain between controls and AD subjects, and that FA showed similar results except for the parietal lobe and internal capsule . Furthermore, a few studies in healthy older subjects at risk for AD showed abnormalities in MD values in regions known to be affected in AD [80, 81]. In addition to showing early alterations in MCI patients, DTI appears to correlate with cognitive performance independent of cortical atrophy, which suggests access to an upstream process in the neurodegenerative cascade . The search for appropriate DTI and high angular resolution diffusion imaging parameters for the diagnosis of cognitive impairment is still a work in progress . Various parameters behave in different ways according to localization . In addition to the choice of diffusion parameters, recent tractography studies illustrate the superiority of analysis methods that can manage crossing fibers [85, 86]. The analysis of large-scale networks involved in cognitive functions might enable more specific correlations between brain structure and function . Table 4 summarizes DTI findings in AD and MCI based on the two recently published meta-analyses [78, 79]. Effect sizes are summarized per region [78, 79]. AD, Alzheimer's disease; MCI, mild cognitive impairment; NC, normal controls; PCg, posterior cingulate gyrus; PHg, parahippocampal gyrus; SLF, superior longitudinal fasciculus; UF, uncinate fasciculus. aNegative effect size indicates abnormality and positive effect size indicates integrity of white matter. bPositive effect size indicates abnormality and negative effect size indicates integrity of white matter. The DTI technique shows promise as a potential imaging biomarker in the early diagnosis of high-risk states for AD, and has similar accuracy to volumetric hippocampal measures for the diagnosis of established AD. However, due to significant heterogeneity in studies in terms of patient characteristics and image-acquisition parameters, DTI is not currently recommended for the clinical investigation of patients presenting with cognitive impairment (level of evidence 3b). Potential clinical applications of tractography include support for the diagnosis of neurodegenerative diseases , but also identification of amnestic MCI [82, 89] and prediction of progress to AD in risk groups [90, 91]. Further studies with standardized image-acquisition and analysis protocols, a standardized definition of participants, a larger number of participants across age and gender distributions, and a longer follow-up period will increase validity and reliability of the data and allow better generalization of results to the individual patient. In this section we briefly discuss neuroimaging modalities that hold promise as research tools in cognitive disorders but have less published literature, which limits conclusions and recommendations at this time. PET imaging offers a variety of techniques that have a significant role in investigating patients with cognitive impairment. Amyloid imaging with [11C]-labeled Pittsburgh compound-B amyloid and [18F]flurodeoxyglucose PET are covered elsewhere. Several novel amyloid ligands are being developed to enhance sensitivity and specificity of PET amyloid imaging and to increase feasibility of scanning by having a longer half-life (see Figure 1 for an example of amyloid binding with the novel ligand [18F]florbetapir). Amyloidbinding SPECT agents are being considered, which will offer another feasible method of imaging amyloid . Amyloid binding with the novel ligand [18F]florbetapir. Axial, sagittal and coronal [18F]florbetapir average images show typical amyloid images in controls and Alzheimer's disease (AD) patients. Blue arrows, cortical uptake; red arrows, white matter (WM) uptake. A negative [18F] florbetapir scan is characterized by a low cortical uptake and high uptake in the adjacent WM. An abnormal scan is characterized by a focal increase of cortical [18F]florbetapir uptake. Increased cortical uptake is evidenced by the reduction between cortical to WM contrast in at least two brain areas. A negative scan indicates sparse to no neuritic plaques, and is inconsistent with a neuropathological diagnosis of AD at the time of image acquisition. A negative scan thus implies reduced likelihood of clinical AD. A positive [18F]florbetapir scan indicates a neuropathology consistent with the presence of moderate to frequent amyloid neuritic plaques. However, the interpretation of a positive scan should take into consideration that amyloid neuritic plaques may also be found in patients with other types of neurologic conditions as well as older people with normal cognition. Images obtained from Alzheimer's Disease Neuroimaging Initiative (ADNI) and processed at PR-N's laboratory. A molecular probe with high affinity to tubulin associated unit (TAU) fibrils and a low affinity for synthetic amyloid-β1-42 fibrils is in the early phase of development . There is evidence for regional neurotransmitter alteration in AD. Imaging the dopamine system with PET tracers can help to differentiate AD from Lewy Body Dementia (LBD) and LBD from Parkinson's disease. Several PET ligands are available to image the serotonin system; for example, 5-HT1A imaging can reveal hippocampal neurodegeneration in AD, and reduction in 5-HT2A binding has been demonstrated in AD and in MCI patients. Imaging the cholinergic system offers better understanding of the basic mechanism of cognitive symptoms and response to cholinergic therapies in AD, Parkinson's disease dementia, LBD and other dementia. Cholinergic nicotinic declines have been measured with PET nicotine receptor ligands. Reduced acetyl cholinesterase activity has been shown in MCI converters, AD, LBD and Parkinson's disease dementia compared with healthy controls, and basal acetyl cholinesterase activity predicts therapeutic effects of cholinesterase inhibitors. Neuroinflammation is a neuropathological feature of numerous neurodegenerative conditions. PET allows for in vivo quantification of various aspects of neuroinflammatory responses, which may serve to monitor the effects of pharmacological interventions. Using PET ligands, high phospholipase enzymatic and high astrocytic activity has been described in the AD brain [94, 95]. Finally, microglial activation detected via specific PET ligand binding has been described in several neurodegenerative conditions. Biomarkers of tissue pathology have potential applications for monitoring disease progression and evaluating the effects of new pharmacological interventions, accumulation abnormal proteins in the brain, neurodegeneration, neuroinflammation and neurotransmission. Table 5 presents common PET ligands used to delineate different neurobiological processes in cognitive disorders. Interested readers are referred to recent published reviews for more details [96, 97]. In this technique, the water content in arterial blood is labeled to detect change in perfusion. This method is similar to [18F]flurodeoxyglucose PET as it detects perfusion change but with no exposure to radioactivity. Recent studies using this method have shown hypoperfusion in some brain areas in MCI and AD patients compared with controls, including the right inferior parietal, bilateral posterior cingulate gyri, and bilateral middle frontal gyri, a pattern of hypoperfusion that is similar the one seen with PET and SPECT scan studies in this population [98, 99]. Noncerebral blood flow studies can be performed to differentiate LBD from AD with SPECT agents targeting the dopamine cell membrane transporter. [123I]-labeled ioflupane is useful in differentiating Lewy body dementia from AD with high specificity over 90% . Another noncerebral blood flow SPECT approach is based on imaging of the norepinephrine transporter on the plasma membrane of sympathic terminals in the heart, which are lost early in LBD and Parkinson's disease, but not in AD using the ligand iodine-131 metaiodobenzylguanidine. This tracer is approved for human use mostly for the diagnosis and treatment of paragangliomas. Results in small studies have demonstrated above 90% accuracy for the diagnosis of LBD [101, 102]. The use of ultra-high-field (>3 T) human MRI has increased over the past two decades. The advantages of ultra-high-field MRI include greater signal to noise ratio, reduced scan times, increased image resolution, increased spectral dispersion, and novel contrast. However, there are technical and logistic challenges including increased magnetic field distortions, decreased radio-frequency field homogeneity, increased power deposition, and the unknown safety profile of most surgical implants at field strengths above 3 T. These issues need to be addressed but initial studies have demonstrated the advantages of this technology for the study of the human brain, and AD in particular [103–105]. In this expert consensus review, we summarize the literature regarding emerging neuroimaging modalities used to study patients with cognitive impairment that are not currently recommended for the clinical investigation of this population. These modalities have a role in identifying indicators of neuropathology, which has the potential to inform research by providing better markers for inclusion/exclusion in clinical and research protocols in the future. For these neuroimaging modalities to have diagnostic value in the individual patient, they must have established validity and to have established sensitivity, specificity, predictive value, and test-retest and interrater reliability. Most of these elements are still lacking for the modalities discussed in this paper. International multicenter neuroimaging initiatives are well underway and provide the opportunity for multimodal standardized protocols allowing combining neuroimaging modalities together with clinical and other biological markers (for example, genetics and cerebrospinal fluid) . Some of the neuroimaging modalities discussed in this paper - such as DTI, resting-state fMRI, and MRS - are quite feasible to acquire during MRI studies. Furthermore, post-acquisition processing and analysis is getting more accessible with the advances in image processing and analysis software. Larger longitudinal studies with improved homogeneity of participants and methods, combining neuroimaging and other diagnostic data, will probably give modalities discussed in this paper clinical utility in the near future. For neuroimaging modalities discussed in this paper, further studies are needed to establish diagnostic utility. Larger, multicenter, multimodal studies with better homogeneity of the clinical population and methodology are therefore needed to establish diagnostic value for the individual patient. RB would like to acknowledge the Ivey-BMO Financial Group Scientist in Brain Disorders Imaging Award. PR-N acknowledges support from the Le Fonds de recherche du Québec - Santé (FRQS) chercheurs-boursiers program, Canadian Institutes of Health Research, Alzheimer's Association and Aisenstadt Foundation. RB is co-founder and Chief Scientific Officer of Bioscape Imaging Solutions Inc. AMB received consultation fees from industry, including Pfizer and Lundbeck Canada. PR-N has ongoing scientific collaborations with NAVIDEA biopharmaceuticals (nonfinancial competing interests). The remaining authors declare that they have no competing interests.